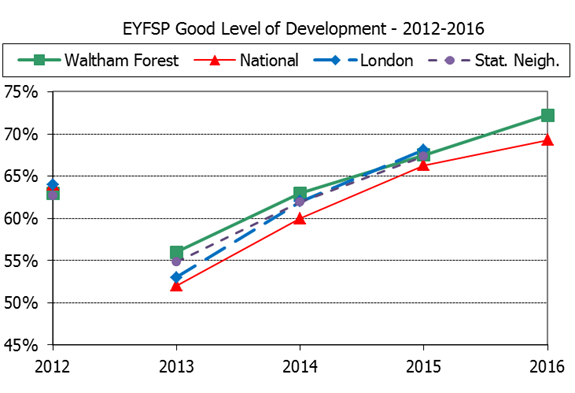 Children in Waltham Forest achieve well at the Early Years Foundation Stage (EYFS). In 2016, 72 per cent achieved a 'good level of development', an increase of four percentage points from 2015. This was above the national average of 69 per cent. At the end of August 2014, there were 435 registered childcare providers in Waltham Forest providing 6,333 places. In March 2015, 80 per cent of all early years providers in the borough were assessed as good or outstanding - slightly below the national and London averages of 85 per cent and 83 per cent respectively. The proportion of children in good or outstanding provision has increased since 2014 and this is higher than all comparators. The proportion of Waltham Forest two and three year olds with places at provision with staff qualified with Early Years Professional Status or Qualified Teacher Status all exceeds the proportions of comparators. In recent years it has been a challenge to find sufficient providers for the 15 hours of EYFS provision per week for two year olds from disadvantaged families, but the service has succeeded in ensuring this provision. The changes proposed in the Childcare Bill may present additional challenges in this area in the coming years, but regardless of these policy changes, the service is focusing on ensuring high quality EYFS provision with a rich curriculum and a sufficiency of places. The data on this page were correct at the time the 'Ambition for Education in Waltham Forest' strategy document was finalised (August 2016).